In fashion-land it's often the smallest details that make the difference. Which explains why cap-toe espadrilles are far superior to standard issue solid hued ones. That little color blocking somehow imparts extra oodles of French-chic cool, as seen in the photo above. Pour La Victoire makes just about the cutest ones, in a variety of shades (my favorites come in denim and red) and they are on sale at Neiman Marcus for a mere $53. And, BTW, you'll also find tons of other discounted deep-summer-worthy staples there (get an additional 25% off select sale items through tomorrow 7/30), including these Michael Kors studded sandals (48% off) this pretty embellished Lanvin clutch (50% off), this striking Peter Pilotto dress (70% off) and this sleek See by Chloe wrap skirt (65% off). 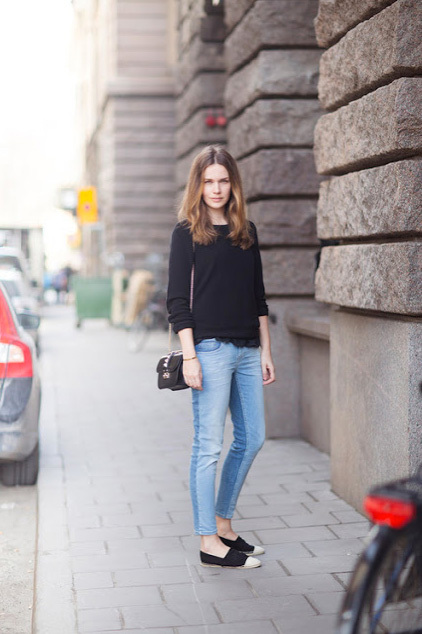 Any idea where those jeans are from? Love them. Do the Pour La Victorie espadrilles run true to size? I believe they do fit true to size, but remember that espadrilles tend to stretch out a bit after a few wears. The jeans are from Zara, from earlier this summer, I believe. I have the red Pour La Victoire. It was a bit big (I normally wear a 7), but I added insoles for extra cushioning, and it fits perfectly.